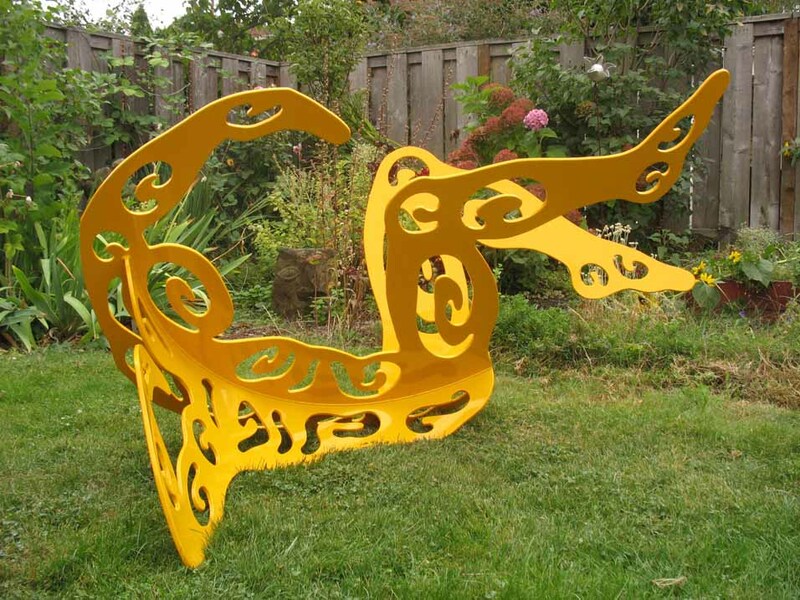 Alisa Looney, Roll & Play, 2007, powder-coated, flame cut mild steel, 36"x75"x48". GOLDENDALE.- Maryhill Museum of Art presents its annual Outdoor Sculpture Invitational through October 31, 2008. The exhibition features large-scale works in a variety of media by Northwest artists Gregory Glynn, Stuart Jacobson, Alisa Looney, David Miller, Dennis Peacock, Mylan Rakich and Tom Urban. The museum inaugurated the Outdoor Sculpture Invitational in 1996 to complement its extensive collection of Auguste Rodin sculptures and to give Northwest artists an opportunity to create and exhibit large-scale works. Lee Musgrave, the museum's curator of exhibits, says "We strongly believe in encouraging the continued development of contemporary Northwest sculpture. The dramatic views and rugged landscape of the Columbia River Gorge provide a unique setting to experience these sculptures, which this year range from the figurative to abstract, distinctly reflecting each artists' sensibility and influences. Artist Alisa Looney of Portland says "I draw from years of experimental dance, the place where I find my greatest moments of free expression." Her process starts by creating drawings of live dancers, which she then transforms into three dimensional paper forms, and finally, into large-scale metal sculptures. Gregory Glynn lives on Bainbridge Island, Washington and draws inspiration from forces of nature to create organic looking abstract sculptures which, he says, "evoke a sense of a world in flux and reveal a potency that dwells in living forms." A golden cloud and a shaft of red light are what David Miller of Eugene, Oregon says motivated his travertine stone sculpture. Despite its weight of almost one ton, the piece appears light and billowy. Stuart Jacobson of McMinnville, Oregon also works in stone. Trained in landscape design, Jacobson says he enjoys the resistance and physical challenge of working with stone. "I was inspired by the Moai sculptures of Easter Island and try to give my sculptures a timeless quality, fusing primitive with modern aesthetics." At 16 feet high, Quarter Banker by Dennis Peacock, is the tallest sculpture in the exhibit. Peacock, who resides in Shelton, Washington, says "Poetry, subject to my own interpretation and context, works as an initial catalyst." Peacock's characteristic forms - abstract, linear, elongated and graceful - also reference the artist's enduring childhood memory of a large ship beached on the Oregon coast. In addition to works in the 2008 Outdoor Sculpture Invitational, visitors to Maryhill can also see sculptures from the museum's collections that are on permanent display: on the grounds -- works by Brad Cloepfil, Tom Herrera, Mel Katz, Heath Krieger, Jill Torberson, Julian Voss-Andreae, Jeff Weitzel and Leon White, and in the museum -- Auguste Rodin.